PLUS $199 DOC FEE, TAX AND TITLE. 2011 SUZUKI VL800TL1 - Boulevard C50T, NEW TIRES, FRESH SERVICE, GOOD CONDITION, READY TO GO! $4495 PLUS $199 DOC FEE, TAX AND TITLE. GET A GREAT DEAL FROM MID-OHIO POWERSPORTS ON THIS BEAUTIFUL CLASSIC 2011 SUZUKI VL800TL1 - Boulevard C50T IN TWO TONE WHITE AND SILVER! WINDSCREEN, STUDDED SEATS AND PASSENGER BACKREST, SADDLEBAGS, NEW TIRES, FRESH SERVICE, GOOD CONDITION, READY TO GO! $4495 PLUS $199 DOC FEE, TAX AND TITLE. YOUR NEXT GREAT RIDE STARTS AT MID-OHIO POWERSPORTS!!! Meet the Boulevard C50T— a classic cruiser with bold style and no equal. Like the C50, it too boasts a fuel-injected 45-degree V-twin engine that cranks out abundant torque down low, matched with exciting top-end performance. It also has a spacious riding position and smooth suspension that encourages you to take to the open highway for true long-range cruising in maximum comfort. With a multitude of features, the C50T also establishes its own unique identity. The C50T has a range of custom features that are ideal for all-day cruising, including an aerodynamic windshield, custom-made leather saddlebags and a well-padded backrest designed especially for passenger comfort. So go out and experience the open ride in style today. Hop on a C50T and experience the ride for yourself! A long 33-degree rake angle and 65.2 inch wheelbase provide a smooth, comfortable ride. The C50T has a wide, comfortable seat with low 27.6 inch seat height. The passenger seat can be removed for a bobbed rear fender appearance. Wide handlebars and forward-mounted floorboards and foot controls provide a more comfortable ride around town or on the highway when cruising. Telescopic forks provide long 140 mm (5.5 inch) of wheel travel. The forks also have polished aluminum sliders and polished stainless steel stanchion-tube covers for a distinct look. The C50T has a link-type rear suspension. It connects to a truss-style swingarm and a single shock absorber that is 7-way spring preload adjustable. A single front disc brake with a large 300 mm rotor and 180 mm rear drum brake provide strong braking performance. Traditional spoke wheels with chrome-plated rims carry wide 130/90-16 front and 170/80-15 rear whitewall tires. The C50T has a custom-designed, height adjustable windshield that provides classic styling and offers full wind protection. It includes unique chrome garnish with a Boulevard emblem. The C50T comes standard with large capacity, textured leather saddle bags with Boulevard emblems and convenient twist-lock fasteners. Attractive studded seats, plus matching touring-style backrest with a unique pivoting backrest pad, provides increased passenger comfort. A powerful multi-reflector headlight is housed in an attractive case with a stylish headlight rim. The headlight switches off during startup to reduce the load on the battery. The C50T has bright, multi-reflector turn signals designed for high visibility and attractive appearance and a low maintenance LED taillight. It also features standard four-way emergency flasher and high-beam passing switch. The fuel tank-mounted speedometer features a LCD fuel gauge, a clock and indicator lights. All the cables and wiring are carefully routed for a detailed look. 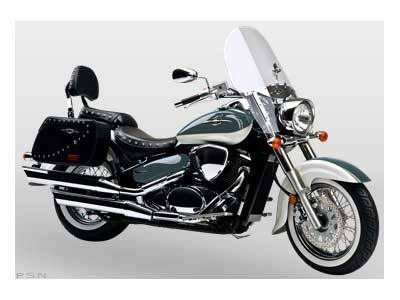 All other Suzuki Boulevard Authentic Accessories will fit the C50T. The C50T is equipped with a 805 cc, SOHC,4-valve-per-cylinder, 45-degree V-twin engine, tuned for sufficient / torque and a comfortable ride. Its offset crankpins deliver perfectly balanced firing intervals while its liquid-cooling design boosts efficiency and fuel economy. The C50T comes with chromed and staggered dual exhaust that was designed for a deep rumbling sound and strong torque delivery. A 32-bit ECM provides precise control of ignition timing and multi-hole-type injectors ensuring quick startup and excellent drivability under all conditions. A cutting-edge 3D-mapped digital ignition system and throttle-position sensor enhance the hallmark big V-Twin low-end torque. Electronic fuel injection system features the Suzuki Dual Throttle Valve System (SDTV), which maintains optimum air velocity in the intake tract for smooth low-to-mid rpm throttle response and high torque output. Also includes Auto Fast Idle System (AFIS), which eliminates fast idle conditions. Dual spark plugs on each cylinder provide better combustion and lower emissions. A wide-ratio 5-speed transmission features a high fifth gear ratio for relaxed highway cruising. The C50T is equipped with a low-maintenance shaft final-drive system. Shaft drive is clean-running and offers low torque reaction.